We invite your proposals for topics and session organizers for CFR program at the 2014 World Congress. Please submit as soon as possible but no later than 1 February 2013 24:00 GMT. You are welcome to submit a possible topic, recommend an organizer or volunteer to be one, and/or suggest a format. For a complete list of possible formats and responsibilities for session organizers here. For details on CFR deadlines and guidelines see here. For each topic propose a short title and a detailed description of the focus, objectives, and dimensions to be covered (up to 300 words) plus preferred format and language (English, French or Spanish). For each organizer or co-organizer provide full name, highest university degree held, current position including institutional affiliation with complete mailing address, a phone number, and email address. Especially needed are organizers and suggestions for joint sessions with other RCs. We have until 7 April 2013 24:00 GMT to finalize these. Proposals for Integrative Sessions, which must involve at least 3 RC/WG/TG, 3 National Associations or a combination of any three units, must be received at the ISA Secretariat by 15 January 2013 24:00 GMT. Guidelines for applying for integrative sessions are available here. The program coordinator (PC) will facilitate integrating similar sessions and adjusting topics to best complete a well-rounded and comprehensive program. 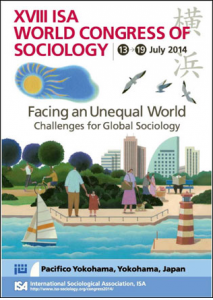 A final list of sessions and their descriptions and the language in which they will be held is due to the ISA Secretariat at isa@isa-sociology.org for posting on the ISA Congress website as Call for Papers by 7 April 2013 24:00 GMT.